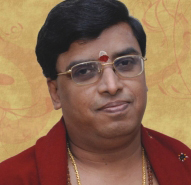 Udayalur Kalyanaraman is committed to the old tradition - Prachina Sangitam. The spirit of his revivalist movement goes beyond bringing together innumerable expert singers who also belong to impressive Guru-Sishya paramparas, to sing for large gatherings. He has just been singing beautifully, mesmerising his listeners with a style which had been almost forgotten. While critics have been lamenting the lack of devotion in present day Carnatic music, the Bhagavathars along with Kalyanaraman, have shown that devotional music (bhajana sampradaya) is another genre, not to be confused with the elaborate vicissitudes of classical music. The team of Shri. Udayalur Kalyanarama Bhagavatar, Shri, Sethalapati Balasubramaniam Bhagavatar (Brigha Balu), Mridanga Vidwan Shri. Babu Rajashekar and Harmonimum Vidwan Shri. Venkataraghavan (Rajesh) is not just a good team but a well-knitted family. They compliment and respect each other so much, that is embellishes the event. Of course, as the skipper Kalyanarama Bhagavatar doesn't only demonstrate his mastery and hardwork but his Bhakti, involvement and passion to Namasankirtanam. His contribution to the namasankeerthanam community is very significant indeed. His respect to the Guru Parampara as well as the Kanchi Kamakoti Peetam is obvious. Kalyanaraman's lineage is essentially the core of Thajnavur culture, and impressive. From both his parent's, families he can boast of distinguished artists like Puthagaram Ayyaswamy Bhagavatar and Valkudi Santhana Bhagavatar. He grew up under the influential guidance of a famous musician of his time, Tiruvidaimarudur Venkatrama Bhagavatar. In Udayalur which is a stone's throw away from Patteswaram, the young Kalyanaraman, cycled home from school hurriedly, to join the Bhajana group wherever they were performing. He learnt by listening and observation. He also went to every village in the surrounding district, and assimilated the culture of devotion which was kept vibrant by patrons and temples as well as "Maths". He speaks of his Guru's evocative singing with feeling: "When he began the Sankirtanam, by chanting "Sri Gopalavilasini... ", facing the beautiful Radha-Krishna image which was in the Puja, it seemed as if the deities would step out of the picture with folded hands in response. Such was the magic of the music that everyone present felt the presence of Divinity among them." The added touch of irony was that Venkatrama Bhagavatar was visually handicapped. Perhaps that is one of the reasons too, that his singing visualised more powerfully, the "Leelas" of Krishna. Kalyanaraman is no less evocative and sincere in namasankirtanam. He is precise about the traditional system, technique, and content of the music. Above all he imparts "soul" to his music with an abandon rarely heard. Every raga is used to bring out the beauty of the perfectly pronounced lyrics. His husky voice has a quality that is magnetic. You never tire of hearing him. The nuances are well practised, yet sound spontaneous. It is not surprising therefore that Kalyanaraman is busy every day of the week. Along with his trusted accompanist, Babu who has been very supportive not only on the mridangam, new milestones are reached in the avenue of devotional music. He learnt the basics of bhajana from his guru shri. VENKATRAMA Bhagvathar.